Many of us have to work from home. Sometimes we bring back our work from the office to home and do it later at night. 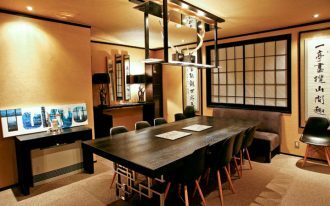 So we know how much comfortable it will be when the home office room is practical, efficient, and offers warm and cozy. 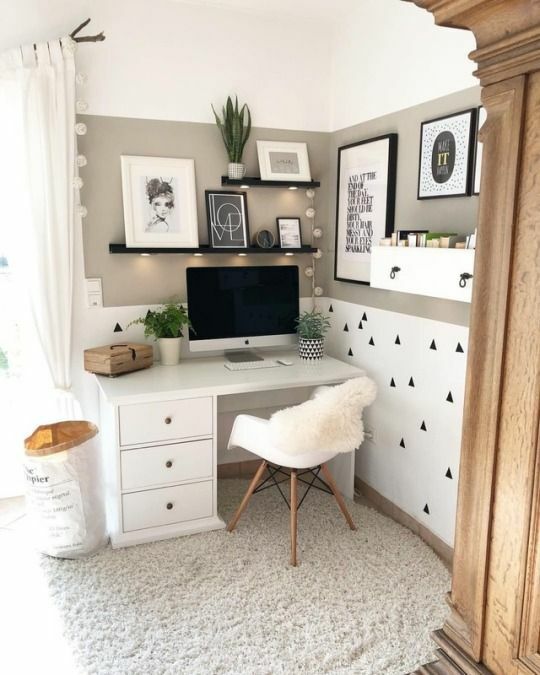 Making a home office comfortable is really important especially for those who need to work many hours in front of table, for work or study. 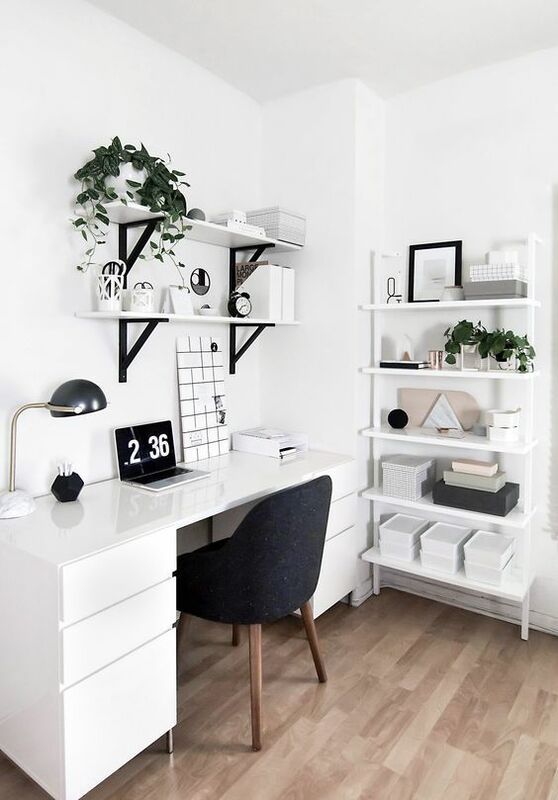 In order to make the room comfortable without neglecting the need to make it both practical and beautiful, here below are some inspirations of modern home offices to help you create your own space. 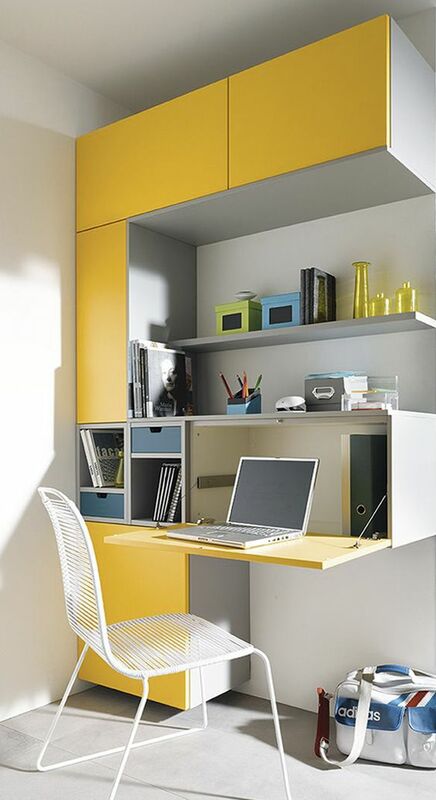 To make a small space as efficient as possible, the small space that you have used need to be able to hold much more. And that can be done with shelving. Seen in the picture below, shelves are spotted as floating shelves and the usual shelves with lighter look. The drawers in the table have allowed more storage too. This have made it possible to display less clutters. 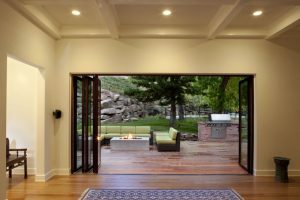 While you might want to show less decorations because you want to make sure that the portion of the walls shows much to bring out spacious effect, it does not mean you have to cut off your love on decorations. 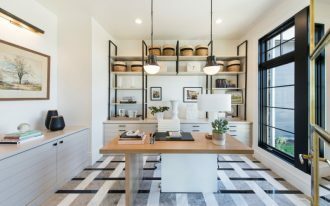 Using unique shelves in the shape of a drawer can bring decorative look with more use. When your space is small and you want to make it pretty as much as you can, using unique design on the table can do it pretty well. Seen in this one is a small corner for you who don’t need permanent table to work. 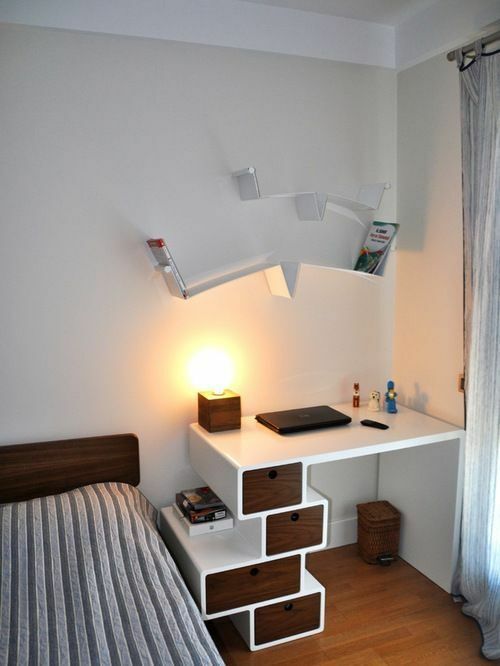 The unique design of the drawers as well as the unique floating shelves above it have allowed this corner to look more endearing. 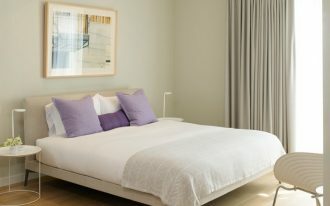 Adding a great hue of color in the ashen look room can bring joy and cheerful note as seen in this picture. 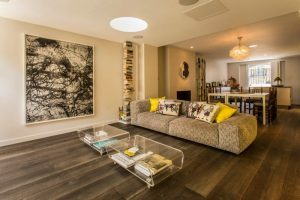 The white and light grey canvas have enabled the room to look spacious but the blue hues on the floating table and shelves makes the room brighter. 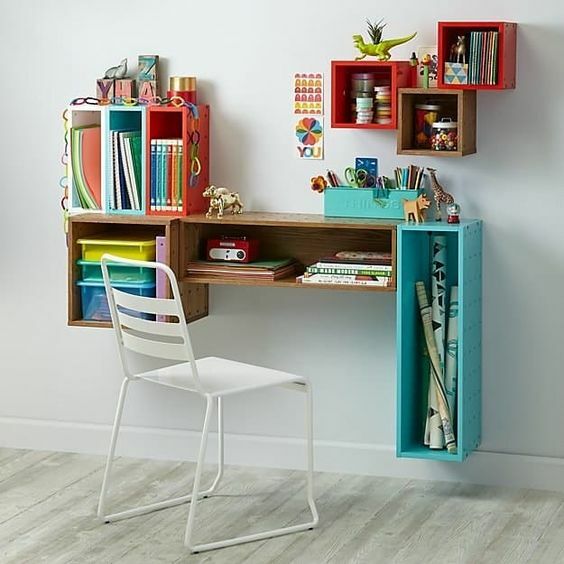 A creative idea is always welcomed when decorating small space. 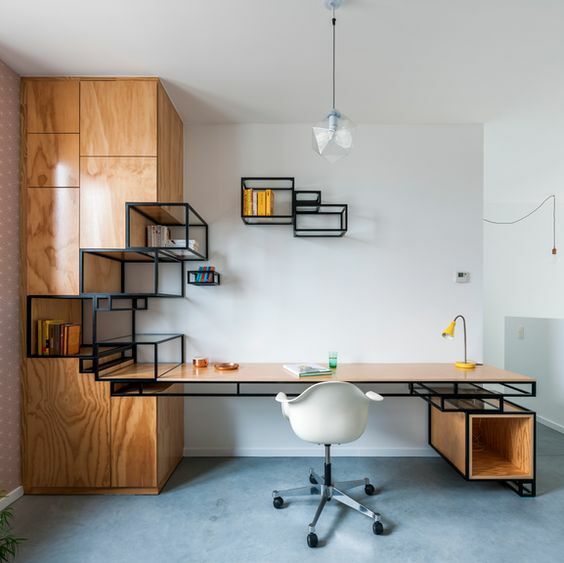 Seen in this picture below, a great office area is created from installing floating boxes on the wall to be floating table and shelves. With different colors, size, and shapes, this simple yet creative idea has brought unique look to the spot. 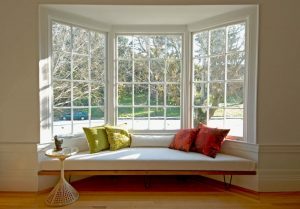 While some people believe that small space should be filled with mini furniture, you actually can put big thing as long as it gives the lean, neutral, and lean effect, like this one here. A large space to work feels really satisfying, especially when you work with so many papers. And a long table lets you do that conveniently. With closed storage and glass shelves, it looks light. Adding office corner can also be done with sturdy cabinet that give a foldable table like this one can be a great temporary office space. If you are in need of the cabinet more than the table, this one here is perfect for you. Making a room for shelves inside the cabinet area is a creative way to make small space looks more endearing and beautiful. 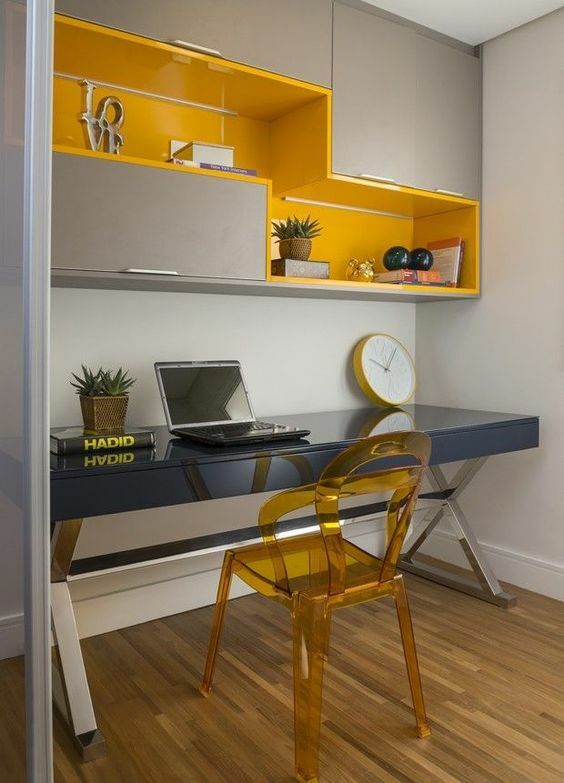 Adding yellow acrylic chair that match the yellow shelves looks light and cheerful. 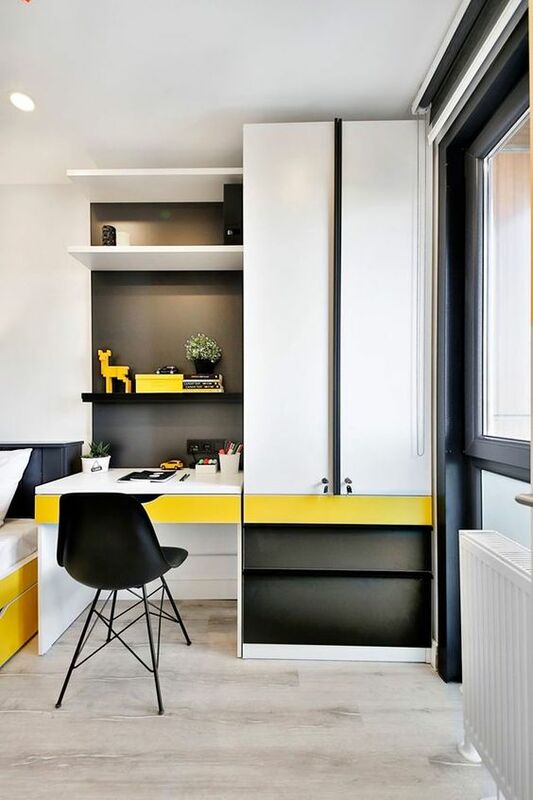 Similar with the previous one, this one too shows a compact area with floating shelves, cabinet, drawers, all in a modern and interesting design and colors. The yellow line is indeed a fun line for the room. 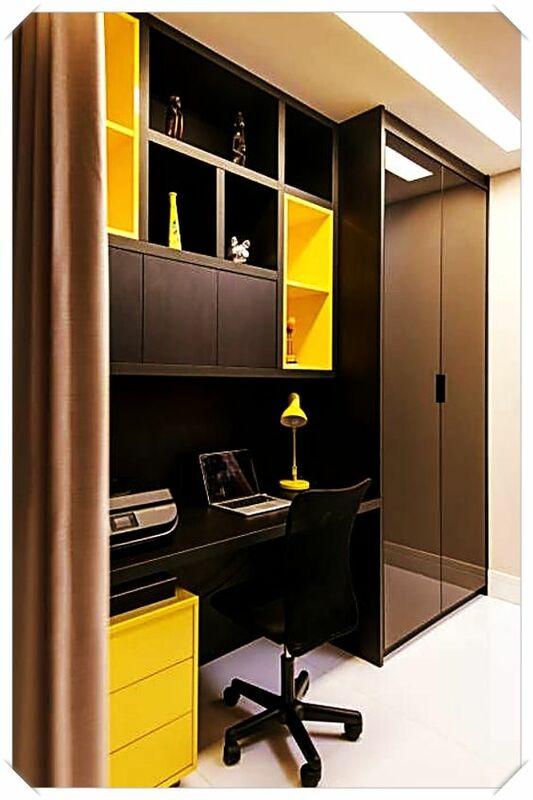 Similar to the previous one, this one here has the deep black and cheerful yellow to the space. 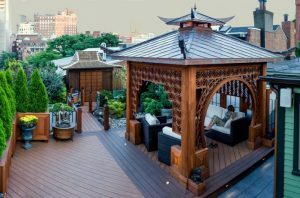 However, with its built-in space, this one here allows you to work in more permanent space.